Old updates including squad icons, past news updates, stats etc. Old news updates and the upcoming stats for previous matchdays on the homepage. 03/08/2012 Website header changed to slimmer version. Content higher up the page. Updated League Table and Results for Week 3. Results and League Table after Week 17 (Matchday 15) updated. Results and League Table after Week 16 (Matchday 14) updated. Results and League Table after Week 15 (Matchday 13) updated. Match Report 13 and Statistics to follow shortly. Results and League Table after Week 14 (Matchday 12) updated. All statistics up to matchday 12 finished - on match pages only. Results and League Table after Week 13 (Matchday 11) updated. Match reports to matches 9, 10 and 11 with pictures finished. Results and League Table after Week 11 (Matchday 9) updated. First changes to the site made. Results and League Table after Week 9 updated. Results and League Table after Week 8 updated. Results and League Table after Week 7 updated. Results and League Table after Week 6 updated. Results and League Table after Week 5 updated. Results and League Table after Week 4 updated. Videos from Match 2 v Diesel Dogs uploaded to CillitBangFC's YouTube channel in 5 parts, including annotations and current score. League Table after Week 3 updated. Weeks 1 and 2 League Table created. End of Season Report and Awards Finished. New menu bar for links around the site, access all pages from any page. Results and League Table updated for week 14. Match Report 13 and stats completed. League Table updated for week 13. Match Report 12 and stats completed. League Table updated for week 12. Results updated for week 11. Match Report 11 and Matchday 11 Stats Completed. League Table and Results updated for week 11. Statistics updated - New Stat added, Total Goals Contributed. Statistics updated - New Stat added, Games Scored In. Matchday 1-6, 12-14 pages created. Match Report 10 and Matchday 10 Stats Completed. League Table and Results updated for week 10. Home page Revamped - News and Upcoming Stats boxes created, Next and Previous Match boxes created. 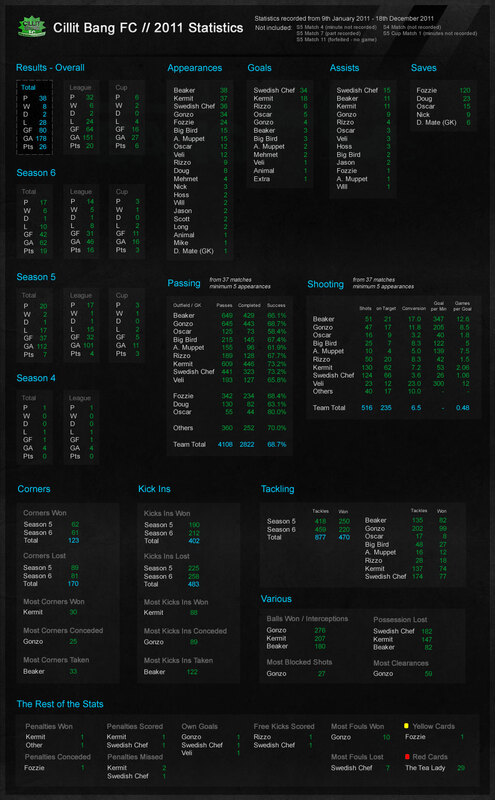 Players Page created - Available to view. Match Reports for Week 9 and Friendly. League Table and Results updated for week 9. League Table for Weeks 1 to 3 created. Matchday 9 matches postponed. Re-arranged fixtures to be confirmed at the end of the season. League Table and Results updated for week 8. Match Report over Christmas, Matchday page is now there but only the week 6 and Week 7 links will work currently, Match Reports for week 6 and 7 have been improved. Statistics page has been improved, the appearances and starts aren't correct exactly yet. League Table and Results updated for week 7. Match 6 - Results and the League Table updated. Matchday 6 - some of it has been done, 1st match report done (hopefully unbiased). Scored in every game to date. Looking for 1st win of the season. Lambon and Long each looking to score 1st goal of the season. Looking for consecutive wins against Just 10. Mike looking for a back to back hat-tricks against Just 10. Stroud looking for back to back hat-tricks against Just 10. Wrench looking to score in his 3rd consecutive game against Just 10. 1st ever game against Diesel Dogs. Lambon, Lucho and Long each looking to score 1st goal of the season. Mike looking to beat his best scoring streak of 1 game. Stroud looking to score back to back hat-tricks. Wrench looking to beat his best scoring streak of 6 games. Cillit Bang looking to avoid the double defeat. Cillit Bang looking for back to back wins. Cillit Bang Golden Boot Winner to be decided Stroud or Wrench. Bang is aiming for his 10th goal of the season - 2 more needed. Lucho looking to beat his best scoring streak of 1 game. Mike looking for back to back hat-tricks. Stroud looking to score his 15th of the season. Stroud looking to score against Mighty Ducks FC in both games. Stroud looking to equal his best scoring streak of 3 games. Stroud looking for back to back hat-tricks. Wrench looking to beat his best scoring streak of 4 games. Wrench looking to score his 15th of the season - 2 more needed. Who will be the lucky payer to score Cillit Bang's 40th goal this season? Wrench looking to beat his best scoring streak of 3 games. Wrench looking to score against Just 10 in both games. Bang looking to score against Harvester Allstars in both games. 10th Game of the Season for Mike. Stroud looking to score against Harvester Allstars in both games. Wrench looking to equal his best scoring streak of 3 games. Wrench looking to score against Harvester Allstars in both games. 10th Game of the Season for Lambon. 10th Game of the Season for Long. Long looking to score against Onshore FC in both games. 10th Game of the Season for Stroud. Stroud looking to beat his best scoring streak of 3 games. Lambon looking to beat his best scoring streak of 1 game. Long looking to beat his best scoring streak of 1 game. Stroud is aiming for his 10th goal of the season. 10th Game of the Season for Wrench. Wrench aiming to be the only player to score against the team in both games.